C4S6CD14 Ray was a joiner who inspired by listening to Stephen Stills decided he wanted to make music and so did. I listen to Steven Stills and a lot more artists and they all make me want to make music, unfortunately I don't have to talent of Mr Lamontagne! His first release Trouble exposed the world to Ray Lamontagne's beautiful voice but as well as an amazing voice he has a real talent for writing heartfelt songs dripping in emotion taking you back to a time where Laurel Canyon was the place where all the cool guys hung out and wrote classic songs for fun! 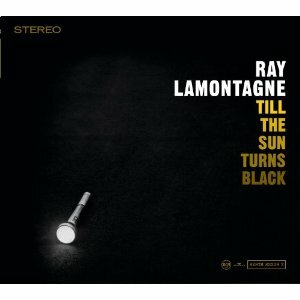 Of Ray Lamontagne's four releases this is his second and my favourite. I must say whilst I have the opportunity, I hate the cover to this CD, a torch really, I know the title intermates a eclipse of the sun but if the best the record company could think of was having a torch on the cover then they would have been better off being leaving it totally black. Rant over, onto the important stuff the music, this album has so many great track on it I don't know where to start, Be Here Now opens the album and it builds quietly into what I believe is one of Ray Lamontagne's greatest songs. It starts with the music gradually growing in volume whilst Rays voice is no more than a hushed whisper calling out "don't let your heart get heavy" and "don't let your soul get weary" before he breaks into the command "Be Here Now". I have seen Ray twice live and this song was my absolute highlight. On a note about concerts Ray suffers with really bad stage fright which makes the interaction between songs somewhat awkward however the music makes up for this tenfold. I could write about this album for ever and a day dissecting every track but I suspect some of you will be ready to stop reading now, if in fact anybody ever gets this far down! So what I will say Empty, Barfly, Three More Days are Till The Sun Turns Black are all gems of songs and Truly Madly Deeply as a beautiful instrumental which says so much without actually saying anything. I hardly every start playing this album without playing it all the way through it's just special and I recommend anybody who likes, timeless music made by people who love making music for all the right reasons to go and get this if you haven't already!